The process of UV bonding is a relatively new one but one that is growing in popularity. It has some fantastic advantages over other methods, including the finished appearance and the ease of the process. In this post we’re going to look at the ins-and-outs of UV bonded glass, discussing how it works, where it is most commonly used and why so many people are choosing it as their preferred method. UV bonding is a way of joining two pieces of glass together. It uses a special adhesive or glue that ‘sticks’ the glass together and eliminates the need for extra screws, bolts or fixings. The ultraviolet element of the name comes from the curing process; once the special adhesive is in place, it is then ‘cured’ under a UV bonding light. This adhesive process is popular because it is incredibly secure. In fact, it often leaves a join that is stronger than the glass itself. It is also attractive: the adhesive is transparent, and should appear almost invisible on the panes of glass. UV bonding is one of the most popular ways to bond glass. A predominant reason for this is down to the durability of the bond: it is so strong, and it lasts such a long time. Of course another reason is the sleek finish it gives. It is easy to control and should always create a clean, clear join. The final reason it is so popular is that the UV bonding process has many versatile uses, not just for joining glass to glass. How Does UV Bonding Work? UV light bonding glue is sometimes referred to as liquid glue. This is because it stays liquid for prolonged periods, and is stable at room temperature. In fact the only thing that can ‘activate’ it and make it dry to form a bond is exposure to a UV bonding light. This process works because of the intensity of UV light. When a UV glass bonding light is shone on the adhesive, it creates a chemical reaction within the glue. This causes the adhesive to harden, which in turn forms the bond. This process is called ‘curing’. The whole procedure can be completed very quickly. Applying the light for as little as 3 seconds can create a durable, robust bond that lasts. Alternatively, you can leave it for longer to make it more secure, or even apply a second layer to create an unbreakable bond. You may also need to leave it on longer depending on the wattage of the UV glass bonding lamp you use and the thickness of the glass. The stability of the compound and the specific conditions needed for the UV liquid glue to cure, makes this technique much simpler and more reliable than other methods such as drying. In other bonding methods, the adhesive is cured by evaporation. This process is massively unpredictable and can be easily affected by a number of variables, including temperature and humidity. In comparison, UV bonding allows you complete control of the curing from start to finish. This is one of the reasons it gives such good results. The speed and the control that the process allows also means that it gives very consistent results. When the best results are strong, stable and sleek joins that stay secure and look great, this consistency is a brilliant bonus. It’s a technique that promises optimum quality. You can always trust your UV bonded glass will last a long time and look lovely for the entire duration of its life. What is UV Bonded Glass Used for? Most types of glass can be bonded using a UV bonding liquid. The only real requirement necessary for the glass is that the surface of it is very flat, very bright and very polished. If these conditions are met, you should be able to create a formidable, unbreakable bond using UV bonding liquid glue. And it doesn’t just work to secure glass against glass. You can also use this technique to attach wood, plastic and even metal parts such as legs, hinges or handles to glass as well. It is also perfect for use in making modern, minimalist and stylish accessories such as umbrella stands, magazine racks and ornaments. Of course, you don’t have to be constrained by the clear finish that UV bonding provides either. The adhesive makes a completely flush surface that can be sanded down and covered, decorated or even painted with ease. There is nothing stopping you from giving a bonded surface a beautiful, unique, decorated look. This technique excels in the construction of glass display cabinets and trophy cabinets. The transparent joins allow the maximum possible light to get in, ensuring display items are always shown to their best advantage. Even better, the clean lines only enhance the intricacies of the items contained within. When combined with an opaque base or back to the case, these cases can also provide a gentle diffusion of natural light which will further flatter their contents. In the creation of display cabinets, you can also use this process to attach locks, hinges and runners. Again, you can trust in the security that these additions will provide when they’re attached to the cabinet by UV bonding: impossible to remove without breaking the glass, they keep any contents safe and secure, while displaying them clearly and attractively.. The final main use for UV glass bonding is in architecture. The strength of the bonds mean they are well suited for use in the construction of staircases, balconies and doors. Designed in glass, these features can enhance any interior and turn it into a modern, stylish space. Using UV activated adhesive, is one of the most popular ways to bond glass. With it’s long life and clean look, we suspect you will now see why so many people choose it. You may not be aware of it, but you probably see glass balustrades way more frequently than you realise. They are actually a common architectural feature, protecting people on staircases or at heights. But the word ‘balustrade’ may seem quite intimidating and definitely suggests a complicated design item. To clear this up, we’ve put together this post to help you get to grips with what a glass balustrade is, where they can be used and why you would want to use them. What is a Glass Balustrade? The word ’balustrade’ may seem unusual and formal, but is a technical term for something that is almost everywhere. It is basically defined as a rail that is supported by pillars, posts or panels (which are technically called balusters). This means that railings, banisters and handrails are actually all types of balustrades. And these really are common. Obviously, a glass balustrade in particular is one that features glass, usually in the supports beneath the rail, but not exclusively. There are two primary types of glass balustrade. Most commonly, glass panels can be used to fill the space between posts and rails, but they can also be left to stand alone. That leaves the edge of the panels to form the ‘railing’. These ‘freestanding’ balustrades are called ‘structural’ or ‘cantilever’ and are perfect when you don’t want a handrail and prefer a completely clear surface. Choosing a structural balustrade has a lot of visual benefits, but it will also have big impact on the type of glass that you can use. What type of glass is used for balustrades? As one of the main purposes of balustrades is to ensure safety, there are quite a few recommendations around what glass should be used to construct them. Firstly, you can only use toughened or tempered glass. This means it has been treated with extreme heat in order to strengthen it. This robust, safety glass can be up to five times stronger than glass that is untreated. The glass tempering process should also ensure that if it breaks, it shatters into smaller granular pieces, rather than sharper, ragged shards. Laminated glass can also be used for balustrades as it provides extra protection from breaking. Laminated glass has a very thin layer of plastic sandwiched between two slim panes of glass. Though you can’t see this wafer-thin sheet of plastic, it helps the glass hold together if it gets broken. Another big constraint on balustrade design, is how thick should a glass balustrade be? In most cases, around 10mm thickness is needed for balustrades which also have posts supporting them and at least 15mm thickness is needed when used for structural or cantilever balustrades. Regardless of the thickness, any glass will always need to be toughened or laminated. Both types of panels can be finished in a range of ways. For maximum clarity, space and light, they can be left clear. Alternatively, they can be tinted with colour, frosted or sandblasted glass can also be used to incorporate logos or a bespoke design. A lot of specifics around the type of glass you need, will depend on where it’s being used and the structure around it, so it always advisable to check the needs of each particular project. 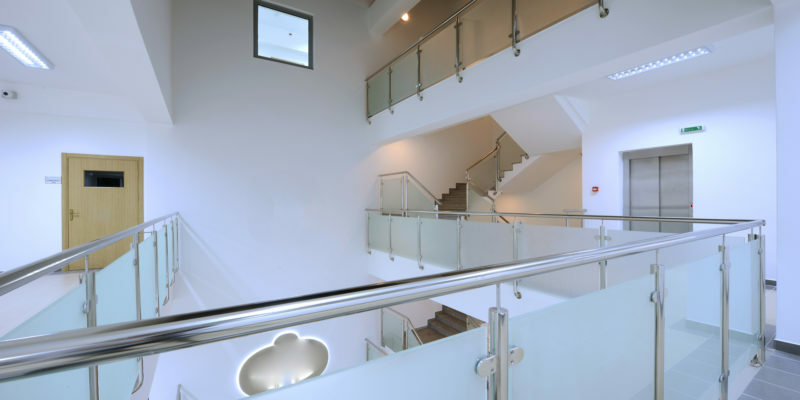 Where Can Glass Balustrades be Used? Glass balustrades are a highly popular choice for both internal and external design. This isn’t surprising when you see how many benefits they have! The thick, tempered glass commonly used in balustrades is incredibly safe. Treated to make it almost as strong as steel, this glass hardly ever breaks making it a great choice for family homes or busy offices. The transparency of glass brings a whole range of design benefits to a building. Being able to see straight through a space will maximise its size, making it feel roomier and more open. It will also allow light to flood in, which helps the room feel even bigger and brighter! Wide, smooth panes of glass can be swiped with a soft cloth and cleaned in minutes. Compared to the intricate designs you find on balustrades made from wood or metal, which require fiddly dusting, polishing and primping, the smooth surface of glass is a dream to maintain. Our glass cleaning top tips blog post should also help. As well as being secure and safe in the short term, glass balustrades age brilliantly too. They won’t warp or rot and can withstand exposure to extreme elements. They can’t be infested by pests or gnawed by pets. They won’t fade in colour, or age in texture and if maintained correctly, will look sharp and smart for their entire life. You might not realise it, but glass is a really environmentally-friendly material. Its durability means it lasts for ages and won’t need major updates or modifications in its long life. Plus, if the unthinkable happens and you decide to remove the glass, this material is often recyclable and easy to dispose of! Obviously, the biggest benefit to glass balustrades is their beauty. Their stylish simplicity will match brilliantly with a minimalist, modern decor but they are also incredibly versatile. Their ability to maximise space can help to open up dark, dingy spaces into bright, beautiful ones. Despite having a rather daunting name, balustrades are actually all around you, and feature in almost all buildings with two or more floors at least once. When picking a material to make them from, glass is not just a stylish choice, but a smart one too. You can install glass balustrades in a range of places, happy in the knowledge that they are safe, secure and long-lasting. So, if you’re thinking of updating or improving the look of your property, re-think your existing balustrades and give glass a go! The first two questions we are usually asked about double glazing are, “how much money will it save” and, “can double glazing reduce noise?” The answers are, “more than you think” and, “yes, absolutely!” it really is a wonderful invention. But why is double glazing so good? Double glazing doors and windows have made our homes warmer, quieter, more energy efficient, and have even given us a welcome added layer of security! Here at KLG we offer a huge range of double glazing units to meet individual requirements for trade and retail customers. Not convinced yet? Let us tell you more about this game changing invention. How Are Double Glazed Windows Made? Double glazed windows are made by taking two panes of glass separated by a spacer bar and sealing them together into a single unit. The gap between the panes is filled with a gas before the unit is hermetically sealed (which means the gas cannot escape and no air can get in). The gas used varies, sometimes it’s just dehydrated air, but the most commonly used gas today is Argon. Filling the cavity between the panes of a double glazed unit with dehydrated air or gas has the effect of reducing thermal and acoustic conductivity. This is because in this state, the molecules of the air or gas are much less mobile and so much poorer at transmitting sound or heat. Who invented double glazing? We don’t know exactly who invented double glazing, but it is thought to have originated in Victorian Scotland by chilly innovators attempting to combat the harsh winters. We do know that the idea found its way to the USA in the 1930’s when the ‘Thermopane’ was developed by an inventor called Haven. It wasn’t until the 1970’s that double glazing as we know it today became popular in the UK. Why are double glazed windows filled with argon? Double glazed windows are often filled with Argon because it has 34% lower thermal conductivity than air, making it much more efficient. Other gasses are even better than Argon, but they cost a lot more so aren’t often used. The cost of double glazed windows filled with Argon is only about 5% more than those filled with dehydrated air. Is there a vacuum in double glazing? There is not a vacuum in double glazing. Technically speaking, a vacuum is the complete absence of matter and as gas is a matter, the gap between the panes of a double glazed unit is not a vacuum. However, the cavity is filled under vacuum conditions and the resulting space is often vacuum-like (meaning it is sealed at a lower pressure). What is the standard thickness of double glazing? The standard thickness of double glazing varies somewhat according to whether the unit is designed for thermal insulation or acoustic insulation, but generally the cavity width for standard double glazing windows is around 16mm. How Much Money Can You Save With Double Glazing? The money saving effect of double glazed windows primarily comes from how effective they are at conserving heat, and this depends on what we call the U Factor (sometimes referred to as U Value). The U Factor measures the speed with which a window transfers heat, and therefore how well it insulates. What is a good U Factor for a window? A low U Factor indicates a low rate of heat transfer and therefore a window that insulates well; glass with a U Factor of around 1.2 is a good rating for a window. To make things a little simpler, in the UK the efficiency of double glazed windows is rated A – G (A being the most efficient) and this rating takes into account the U Factor of the glass as well as other elements of the window’s construction such as types of frame (wooden frames are good insulators while uPVC frames have a longer lifespan). What is the average cost of double glazing a house? Well in order to work that out, we need to factor in the cost of actually installing double glazing in the first place. The cost of double glazing will depend on the quality of the product you purchase, but the average cost of double glazing a house in the UK is between £3000 – £5000. How much money will double glazing save? Again, it depends on the quality of the double glazing, but an A rated installation in a semi-detached house will save you around £120 a year. This means a £3000 installation would pay for itself in 25 years. However, it’s also important to factor in other long term savings and gains. For example double glazing will help to protect against future energy price hikes, will make your home more secure, and will add value to your property that you can recoup when you sell. Is it worth putting in double glazing? We think the financial argument alone makes the case; it’s a good investment that will likely pay for itself whether you stay put or sell up, and it’ll give you a much better standard of living in the meantime. This, plus the environmental benefits of double glazing, make it a no-brainer as far as we’re concerned! Generally, we reap the benefits of double glazing, such as saving money, better insulation and lower environmental impact over the long term. This is usually fine because double glazing units, particularly those with uPVC frames, have a long life span, and a good double glazed window should last around 25 years. What causes condensation in between double glazing? When water vapour hits a cold surface, condensation occurs. If you’re seeing condensation on the inside pane of your double glazing, the temperature of the glass is too low for the room. You could switch to a more thermally efficient window to raise the temperature of the inside pane, but the problem will most likely be solved by simply improving the ventilation around your home, or using a dehumidifier. Condensation in between double glazing is caused by warm air getting into the cavity, which means your seal is no longer airtight. This is a problem because double glazed sealed units cannot be repaired, so you will require a double glazing unit replacement. Can double glazed sealed units be repaired? As your double glazed windows age, it is not uncommon for a sash to drop or hinges to become worn. If you notice air or water coming in around the sash, it may be that the window no longer closes properly. Use a credit card to check for gaps around the sash and replace hinges or adjust the sash accordingly until the seal is tight again. If the sash looks flush, it may be that the weather seal around the glass unit has gone. This can be replaced but you might consider upgrading your double glazing at this point to the latest standard. Finally, if you can feel a draught between the brickwork and the frame, it’s likely that the sealant has perished. You should be able to fix this by simply filling the area between the wall and the frame, or hiring a professional to do it. Can you just replace the glass in double glazing? If your glass is scratched, you will probably be able to polish out the imperfection relatively easily. If you have more significant damage to your glass work, such as a crack or a hole, it will need replacing, as sooner or later the gas cavity will be compromised. The good news is you can just replace the glass in double glazing, so this won’t be a complete refit. Similarly, anything more than cosmetic damage to the frame will also leave the glass, and your security vulnerable, so replacing the frame might be your only option. 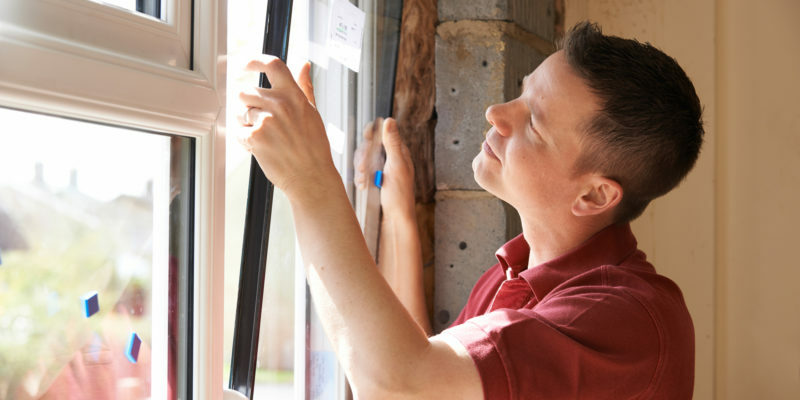 But don’t let this talk of failures and repairs put you off; today’s double glazing units are stronger, better and more effective than ever before and will almost certainly come with a guarantee. They are built to last, and are arguably less likely to fail than single-glazed alternatives due to the huge development and investment they receive from the industry (only 7% of households in the UK now have no double glazing). We hope our guide through the history, construction and benefits of double glazing has convinced you that it really is an investment worth making. Why not take a look at our huge range of double glazing solutions and see how we can start saving you money today? What is Safety Glass and What are Its Uses? Glass is a fantastic invention. It allows us to see into the outside world without having the deal with the weather, while at the same time allowing light to disperse through the interior of a building. Modern architecture wouldn’t be the same without it! But for all of its considerable advantages, glass does have some downsides – the most obvious of which is its fragility. Without proper treatment, the delicate material has a habit of shattering into razor-sharp fragments with the slightest force. 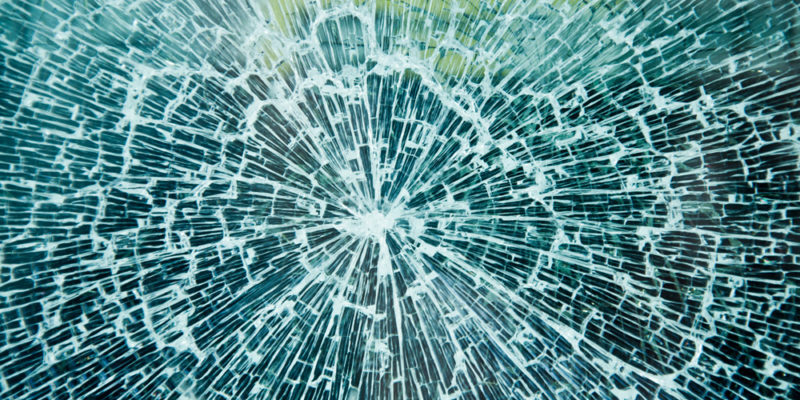 Fortunately, the technology has come a long way over time and among the most notable improvements has been the development of reinforced, or safety glass as it’s commonly known. 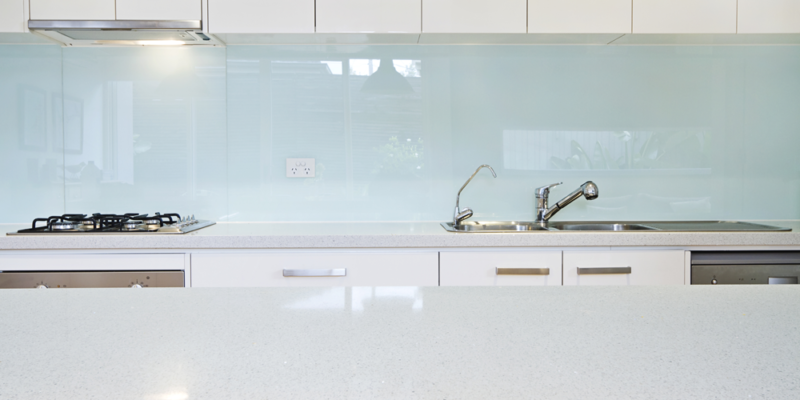 This is a special sort of toughened glass that’s been designed to limit the danger without compromising aesthetics. Let’s take a look at it! What are the Different Types of Safety Glass? Safety glass comes in several different sorts, of which two stand out as noteworthy: Laminated glass and tempered glass. This sort of glass consists of two panels, between which sits a layer of plastic. In the event of an impact, this layer of plastic holds the fragments in place. This makes it difficult for an intruder to gain access. Also limiting the risk of accidental injury. As such, it’s ideal for settings where security is paramount. Toughened glass is formed under special conditions. It’s heated to around 650°C before being chilled under controlled conditions. This results in a difference in tension between the outside and interior of the panel: the outer layers are squashed while the interior is stretched. This results in a glass that’s much stronger than usual. Toughened, or ‘tempered’ glass panels are thus widespread in commercial settings. When they shatter, the tension between the interior and exterior causes the panel to crumble into tiny blunt chunks rather than large jagged shards, significantly reducing the chances of injury. Another variety of safety glass is ‘Georgian wired’. This is constructed in much the same way as laminated glass, except that the interior panel holding everything in place is a wire mesh rather than a transparent plastic sheet. Georgian wired glass is weaker than other varieties, because the wires impinge upon the structure of the surrounding glass, weakening the panel. As such, it’s rarely used today, and serves as a historical curiosity. Where Should Safety Glass Be Used? There are several places where safety glass is mandatory. These include safety-critical locations like car windscreens. After all, collisions are unpleasant enough without adding flying shards of glass to the mix. But you’ll also find safety glass panels in museums, shops, glass tables, telephone boxes, bus shelters and fishtanks. Glazed door less than 1500mm from floor level. Any glazed area in a window less than 800mm from floor level. Windows within 300mm of the door are treated as sidelights, and thus subject to the higher 1500mm limit. Is it Possible to Cut Safety Glass? Once toughened glass is tempered, its size and shape cannot be changed. Cut into it and you’ll cause it to shatter into thousands of tiny opaque chunks. While it may be possible to remove a few millimetres from the edge of a piece, this could cause the tempered glass to weaken and ultimately break later down the line. The best solution is to get the glass cut-to-size from the very beginning. Fail to do this, and the chances are that your project will be needlessly delayed. Laminated glass, on the other hand, can be cut. But it’s a job that requires precision and skill. You’ll need to score the glass on either side before gently moving the panels until they snap along the line. If this sounds a little risky, then it’s probably a better idea to bring a professional in to do the job. Can you Drill Safety Glass? Toughened glass is as impossible to drill as it is to cut: it will shatter as soon as the pressure within the glass reaches tipping point. In the case of untampered, laminated glass, two holes must be made on either side of the pane to stop chip marks emanating from the ‘exit wound’ as the drill passes through. One of the major advantages of safety glass is that it will shatter evenly into small pieces, each of which has fewer sharp edges than those that result from a standard window breaking. 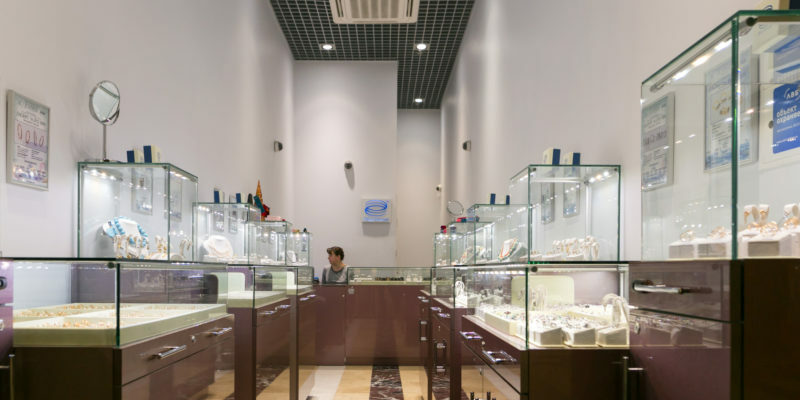 Businesses prefer it for reasons of liability – if a display case is made from safety glass, it’s far less likely to injure a customer who trips and falls into it. It’s worth noting that not all shatter-marks are the same. This is especially so in the case of laminated glass. Edge damage which occurs during manufacture, or during a poor installation, will spread to form a visible crack over the course of months or years. For this reason, it’s worth paying the little bit extra required to get the window professionally installed. Can Safety Glass be Recycled? When safety glass does break, it tends to be slightly more difficult to recycle than standard windows, which in turn are more difficult to recycle than, say, glass bottles. This is because the glass has a different melting point, and thus is more difficult to separate into usable raw materials. Don’t chuck it in with the rest of your recycling. Instead, look for a specialist facility, and ask whether they can take the glass off your hands. So, what have we learned? Safety glass comes in several different sorts to suit a range of purposes. If you’re shopping for a ground-floor door or window, then the chances are that you’ll need toughened (or ‘tempered’ glass). This will shatter into tiny blunt pieces rather than large sharp ones. Proper manufacturing and installation methods will reduce the likelihood of cracks developing after the glass is in place.